1. Can an African dwarf frog live with fish? One of the most common questions is if an ADF can be kept with fish. And the general answer is, no, they shouldn't be. Frogs are generally incompatible with fish because of the conflicting care requirements. One of the main reasons is that feeding would be an issue because frogs eat from the bottom of the tank and they can be slow in finding their food. The fish would have no problem eating whatever food you mean for your frog to have, and because of that, the frog could die of starvation. Keeping your frog in a tank of its own is better all around. 2. What should I feed an ADF? What an ADF should be fed is always a frequent question. One of the best foods you can feed your frog is frozen bloodworms. This food is full of protein, and frogs can easily find and eat it. Another option to consider is soft pellets made for aquatic frogs or turtles. Pellets are nutritious and are easy to feed since they sink to the bottom of the tank. Some foods you should avoid feeding are freeze-dried food and flakes. They tend to expand in your frog's stomach and can cause health problems. 3. How can I tell if a frog is male or female? Another common question is how to tell the gender. Until ADFs are mature, it's nearly impossible to tell. Once mature, male frogs tend to be fairly skinny and have a light-colored bump behind their forearms. Females are usually fatter and do not have the bumps. Also, most mature males "sing" at night and females don't. African dwarf frogs make great pets and are fun to watch. Taking proper care of them so that they live in an optimal environment doesn't have to be difficult. For the past several years, Angela Marie has had multiple aquariums which house both fish and African dwarf frogs. ADFs are one of her favorite aquatic pets and she loves taking care of them and educating other frog owners on their proper care. Is An AFRICAN DWARF FROG The Right Pet For You? African Dwarf Frogs are one of the absolute best choices for first-time owners of exotic pets, but they're also well suited for experienced keepers and breeders. They're very simple to take care of, and setting up the aquarium isn't particularly difficult either as these frogs are exclusively aquatic and so require nothing more complex than a basic fish tank. This makes for a very welcome change from the problematic task of creating a home for a creature that will need both land and water, as is the case with many other amphibians. One of the reasons many people shy away from getting their first exotic pet is the unpleasantness of feeding the animal live food such as cockroaches or baby mice, which is understandably upsetting (or just plain disgusting!) for many people. Fortunately, this isn't an issue with African Dwarf Frogs, because while they can be fed live food, frozen food can be used instead, or even pellets, as these frogs use scent rather than movement to find their food. They should, however, be fed every day, so if you're not around for long periods of time, a different pet would probably be more suitable. Unlike many amphibians regularly found in the pet trade, African Dwarf Frogs are pretty small (not exceeding 1.5" normally) and they don't take up too much space, with only two gallons of water needed for each frog. So even if you live in a tiny apartment, there's almost guaranteed to be enough room for a few of these little creatures. While they're perfectly content to live alone, you can keep several African Dwarf Frogs in the same tank, or even keep other creatures with them if you want. Putting a few fish in with the frogs is pretty common practice, and shouldn't cause any problems as long as they're not aggressive and not too large or small so that they will neither eat nor be eaten by your frogs! Keeping too many fish risks altering the acidity of the water which can be harmful to your African Dwarfs, but if numbers are low you should be fine. Tetra Fish and Goldfish are common tankmates for these frogs, and sometimes alone Betta Fish will work out as well. Basically, it's possible to fit a few cool pets in the same small tank without harming them or compromising their quality of life. Activity levels are often a concern for frog owners, as they're often thought of as slow and boring creatures that never really do much. However, being among the most sociable, active and energetic frogs in the pet trade, African Dwarf Frogs don't fit this stereotype. As they need to swim to the top of the tank for air but feed at the bottom, they can't sit still for too long even if they wanted to. Most individuals will live for around five years (some much longer), so you have to be prepared for a fairly long commitment when you first get some frogs. Still, they're extremely easy to care for, good fun to watch and will complement many of the fish you may already have, all of which makes African Dwarf Frogs a great choice for your first exotic pet. To find out more about African Dwarf Frogs, check out ExoticPetsResources.com, where you can find a comprehensive care sheet. There has been a stark rise in the popular of aquatic frogs among hobbyist in the past few years. Aquatic frogs such as African clawed and dwarf frogs are known for their unique behaviors which are both interesting and entertaining. Anyone who has ever watched a tank of frogs can attest to this. Some hobbyist runs into the problem of housing clawed frogs with dwarf frogs due to a lack of knowledge of the two species. After you read this entire article, you'll be able to fully understand the differences between the two types of frogs. Before we get started with the differences between the two types of frogs, we'll first get an understanding of the similarities of them. Clawed frogs and dwarf frogs are both fully aquatic. They're capable of living underwater without the need to leave the water. These critters also look very similar which often causes people to mistake one type for the other which can lead to problems in an aquarium. Both share similar behaviors such as hanging at around the bottom of the tank while occasionally touching the water's surface. There are quite a few differences between the two. Knowing these differences can be a life or death matter when stocking your aquarium. Miniature frogs grow much smaller than the clawed version with the largest growing a little over two inches. Clawed species have been known to grow as large as eight inches. Only clawed versions are available in an albino form. While both types of frog are equipped with webbed feet, only the dwarf has webbed hands. The eyes on an African Dwarf frog are located on the side of its head whereas eyes of a clawed species can be found on top of the frog's head. While habitat requirements are somewhat similar for both frogs, there are a few differences. For instance, clawed frogs require a bigger tank since they grow so much larger. The diets of these critters are also similar in the fact that they're both carnivores. 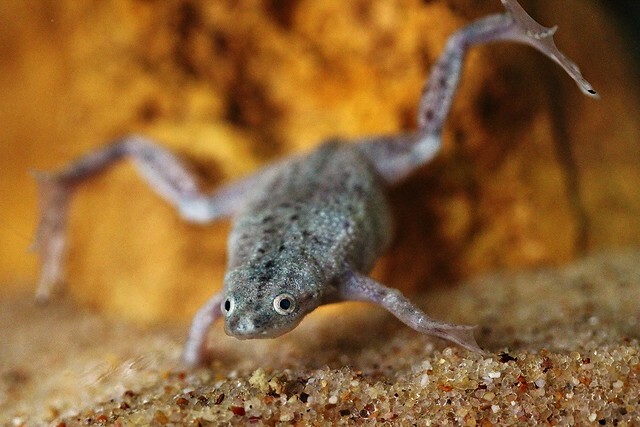 However, clawed frogs are many dangerous predators in a home aquarium. They're capable of eating much larger creatures such as small crayfish and goldfish. Never house African dwarf frogs with African clawed frogs! The much larger clawed frog will kill and eat the smaller dwarf frog. The clawed frog is also known to be a tad more aggressive than the miniature which is normally peaceful. Both types of aquatic critters are extremely entertaining and can be very interesting pets. Clawed frogs are illegal in some states so some people will have to settle for the miniature type which isn't a bad thing. After reading this article, I hope you'll now be able to understand the similarities and differences of both species.